This week Microsoft published communication via MC172925 in the message center that they are removing the capability to opt-out of the modern lists & library capability at the tenant level. This was communicated in the SharePoint community blog by Chris McNulty in early January. 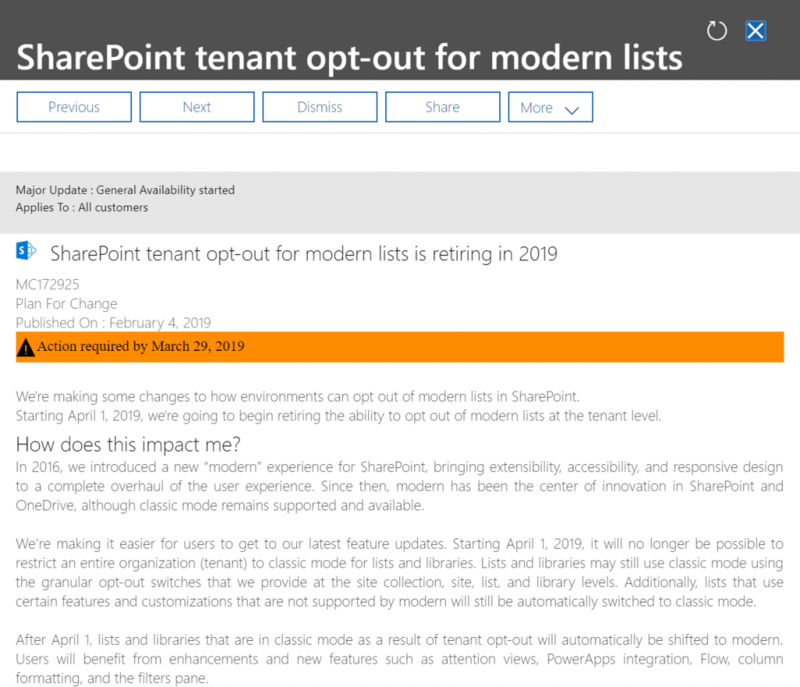 Previously you were able to opt-out of modern lists and libraries for your tenant from the SharePoint Admin Center. Microsoft is effectively nudging organizations who are avoiding making the change to the vastly better modern experience. Organizations who have this classic mode setting enabled and still don’t want the modern experience forced upon their users will still have a chance to do so (for a little while at least) by opting out at either a site collection, web or list level by running some administrative PowerShell commands. I’m betting many organizations will be caught off guard by this switch but will embrace it based on it’s eventuality and when they actually experience the capabilities and beauty of the modern UI. Not to mention the fact that they need to manually act via the PowerShell above to revert back to classic mode. SharePoint Modernization scanner that will give you data about your lists and let you know if your lists are ready for modern UI and report on any possibly problematic customizations. MS Teams now supports up to 5000 users for each team!